How Does Low-Dose Naltrexone Work? When it comes to suffering from pain, autoimmune disorders, viral diseases and even some types of cancer, Low-dose naltrexone or LDN may just be the answer to your prayers for relief. Low-dose naltrexone (LDN) is a safe, inexpensive, yet underused drug that has been used in 50 mg doses for decades to help in the recovery process of those with addiction to alcohol, heroin, and other opiate drugs. But it is only in the last 20 years, that it has been shown to have a profound effect on immune system function using just a tiny amount of 3 to 4.5 mg.
LDN boosts the endorphins which are produced in the brain and adrenal glands that are best known for relieving pain and enhancing our sense of well-being and also happen to be powerful immune system modulators. Besides being a great immune system modifier, it offers protective benefits against neurodegenerative diseases, where chronic inflammation is often the underlying cause. Because of its antioxidant properties, it can reduce the effects of free radicals throughout the body, which in turn reduces both inflammation and disease progression. The body’s cells and systems then begin to work together to help the body heal itself and many experience remission in signs and symptoms of their condition. LDN is an especially affordable medication for patients without insurance. Most patients can afford the monthly cost to obtain it from a compounding pharmacy. Medications for many diseases can be much more expensive. 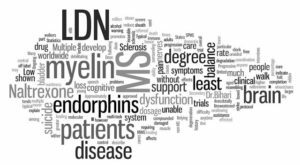 LDN in small doses has shown to have no side effects, is safe for most patients and there is no evidence of dependence. Other than a few contraindications, LDN can safely be taken with almost all medications, foods or supplements. Approximately 10 million people in the US are affected by Fibromyalgia, making it one of the most widespread types of chronic pain. Fibromyalgia is a chronic condition characterized by muscle and joint pain but often accompanied by a variety of other symptoms such as anxiety, sleeping problems, fatigue and morning stiffness. While a variety of both drugs and alternative treatment options are currently available for fibromyalgia, LDN is on the rise as a new source of hope. LDN studies show that it can offer life-changing improvements in pain from fibromyalgia. Patients on LDN experienced a 29% reduction in their baseline pain. Patients on LDN showed a significant reduction in pain plus a significant reduction in either fatigue or sleep problems. LDN was rated equally tolerable as the placebo, and no serious side effects were reported. You may ask how it is possible that one drug can address so many diseases. The key has been found in that they all share a particular feature — in all of them, the immune system plays a central role and low blood levels of endorphins are generally present, contributing to pretty much all disease-associated immune deficiencies.